WHAT IS NEEDED FOR 21ST CENTURY GRADUATES TO EXCEL IN ANY INDUSTRY? T FOR 'TECHNOLOGY' IN FASHION! It is often said that smiling is the outward sign of happiness and connects us to others and helps bond people together. And what makes a smile attractive is, of course, a set of perfect teeth. In a time when people are more conscious of their personality and overall oral health, a good set of teeth plays a significant role. The givers of beautiful smiles all over- the dentists hence are in high demand. In fact, the revenue of the dental care market in India is expected to reach over INR 14,700 crore by FY'2020. The dental care market is anticipated to witness a growth in the number of dental chains which would expand the share of organized dental clinics in the country. Also, demand for dental products and services is expected to grow in the long run driven by the growing awareness about oral healthcare, increase in the number of people opting for cosmetic treatment, and the introduction of new products that reduce patient discomfort. 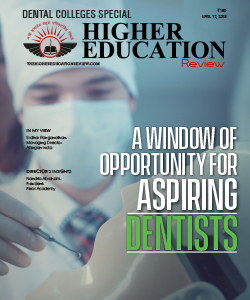 This growth in the dentistry market has given high hopes for students to pursue a career in this field. Dentistry is one of the most desirable professions today. This career offers high wages and flexible work schedule. The professionals also get the opportunity to be their own boss if they choose to start their own practice. Apart from this, as a dentist, one can seek work in the research and advisory departments of pharmaceuticals. However, to get a foot into this profession, the aspirants are supposed to earn acceptable degrees ranging from bachelors to masters level. In the crowd of endless institutions which offers courses in dentistry education, the students are often misguided. 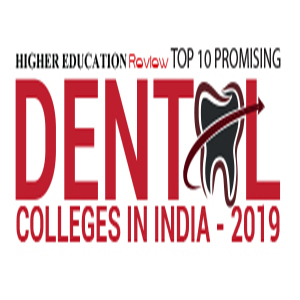 Aiming to provide better clarity on which institutes will actually stand up to the aspirations of the aspirant dentists, we at the Higher Education Review have come up with the 'Top 10 Promising Dental Colleges in India -2019'. Our team of the expert panel, researchers and academicians have invested a lot of time in analysing the varied factors associated with the dentistry education before coming up with the list of dental colleges which are known for their exceptional quality of dentistry education. We hope after going through the featured colleges, you will be able to find your dream college where you can fulfil the dream of becoming a successful dentist. Genesis Institute of Dental Sciences & Research Ferozepur, Punjab The institute has been set up with the commitment to provide excellence in education, patient care, research and community service. M. S. Ramaiah University Bangalore, Karnataka M. S. Ramaiah University is an Innovation University that focuses on UG and PG Education, Research, Consultancy, Training, Skill and Leadership Development. Manav Rachna dental college Faridabad, Haryana The college is a Deemed-to-be-University under section 3 of the UGC Act, 1956, and a NAAC accredited `A' Grade Institution, is a continuum of excellence from the Career Institute of Technology and Management. MGM Dental College and Hospital Navi Mumbai, Maharashtra The college has lived by the philosophy of Gandhiji to serve humanity, with a thought to uplift the dental health. The foundation of The Dental college was laid in 2001 and had been approved and recognized by the Dental council of India. RV Dental College And Hospital Bangalore, Karnataka Established in the year 1992 R.V Dental College is affiliated to Rajiv Gandhi University of Health Sciences, approved & recognized by Dental Council of India. The College & Hospital is located in a spacious building & equipped with the state of the art equipments to treat Dental & Oral Diseases. School of Dental Sciences Noida, Uttar Pradesh A world-class platform where students and faculty cooperate in interdisciplinary education and research that serves its students and patient community, resulting in a well-rounded curriculum that produces dentists tremendously skilled in the art and science of dentistry. Sinhgad Dental College & Hospital Pune, Maharashtra The college believe in the philosophy of education that has an emphasis on all aspects of teaching and learning. The college ensures an excellent academic record to prove the competitive efficiency of all the students. SJM Dental College and Hospital Chitradurga, Karnataka It was established in the year 1986 for the purpose of taking professional Health Science Education to the doors of desirous students in Central Karnataka in particular and across the country in general. The college is affiliated to Rajiv Gandhi University of Health Sciences, Bengaluru. SMBT Dental College & Hospital Mumbai, Maharashtra Established in the year 1984 SMBT aims to o provide free education to children of economically deprived class of the tribal society. The multi-specialty charitable hospital was started with the sole aim of providing help to rural people in need of medical care. The Oxford Dental College Bangalore, Karnataka The Oxford Dental College and Hospital enjoys the rare distinction of being one of the most sought after and best equipped dental colleges in India and Asia. The college is affiliated to The Rajiv Gandhi University of Health Sciences, Bangalore.